Peak season requires a 3 night minimum, arriving on a Saturday. July to mid-August is a 7 night minimum. The guests of this 3 BR, 2 Bath condo located at Vickery Resort enjoy 1400 sq. ft. of living space, granite counters, washer, dryer, a full kitchen stocked with all the appliances and utensils needed to prepare a gourmet meal, large bedrooms, a master bedroom that looks out onto Table Rock Lake, Jacuzzi tub and a walk-in shower in the master bath. This lakefront vacation condo boasts a large private deck overlooking a secluded cove on Table Rock Lake. Also provided with the condo is full dock privileges. 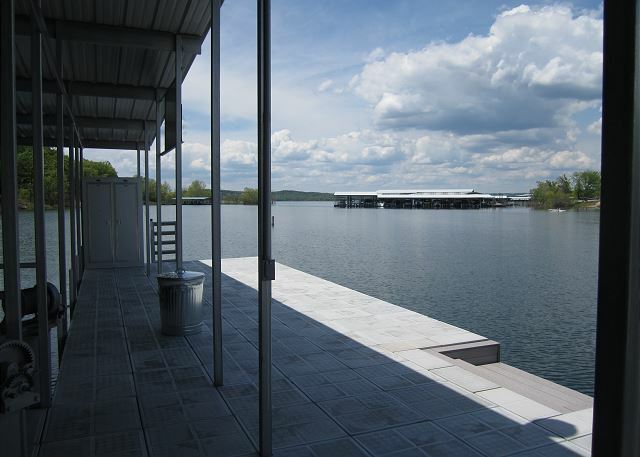 Rent a 11' x 30' slip for your boat and enjoy the lake with the convenience of the State Park Marina minutes from the dock, relax on the swim deck or enjoy a dip in the outside pool. This walk-in condo has no stairs and at parking lot level for easy entrance. Large open floor plan provides you with all the comforts of home! Spend your days enjoying the pool or lake, or relaxing in the Jacuzzi tub in the large master bathroom. Best of both worlds, being as close to Branson as you can get and yet be on beautiful Table Rock Lake. It was absolutely perfect. Everything a family could need was provided. The condo is up to date, clean and incredibly comfortable. The location of this condo is perfect. Far enough away from the hustle and bustle of Branson and yet you can be on the strip within 20 minutes or less. It has everything you need for a perfect lake getaway. The dock for your boat and jet ski is beyond adequate and the swim area on it is perfect with a swing,picnic table and two ladder/steps that lead you directly down into the water. There are also swim mats available to use by the day for a reasonable fee. Each boat slip comes with a locker to store your boating equipment. The condo is very quiet with concrete walls. There is a washer/dryer that comes in handy to dry suits and towels at the end of the day. The kitchen is very well equipped for any meal planning and the gas grill on the nice sized deck is easy to grill on. If you have been thinking of staying here but aren't sure, come on out you won't be disappointed. We loved Vickery Resort! Close to everything, yet off the main thoroughfare - in our opinion, the best of both worlds. Our unit was very clean and the management company very accommodating, professional and friendly. Price very reasonable. We will definitely stay at Vickery on our next trip. The condo is very nice. Quiet, peaceful and great service. We were extremely pleased with our stay at the Vickery Resort. Colleen, the manager, was wonderful in every aspect. Our condo was beautifully decorated, clean and still had a homey feel. We rented the pontoon available at the resort dock and really enjoyed cruising around Table Rock. Very comfortable, clean and quit unit. Very nice deck and dock. The swimming pool is not very big, but it is alright for children. We took a last minute trip with our three granddaughters and son. We found this condo on line and contacted the manager, Colleen. She was very helpful with everything we needed. The condo was perfect with twin beds with trundles for the girls and separate bedrooms for the adults. It was very clean and well supplied. We look forward to coming back in warmer weather to enjoy the deck overlooking the lake and all the lake activities. Stayed for several days while fishing the FLW Coasta Series Championship.Absolutely lovely accommodations right on the Lake and the best Docks I have er experienced. We rented 3 Vickery condos for a family getaway. They are roomy, comfortable, clean, and well furnished and maintained. The view of the lake is scenic and lovely and our grandchildren spent a great deal of time enjoying the lake and the pool. We will come back over and over. It's also so close to Branson and Silver Dollar City. This is the best! Rental was exactly as advertised! Very clean and enjoyable! No doubt a perfect place to bring our grandchildren!!! Very nicely appointed, clean condo near the state park marina; comfortable beds, plenty of space, AC worked well. Peaceful location on Table Rock Lake. Quality amenities: boat slips, leap pad, kayaks, paddle boat. Colleen is tremendous as the property manager; very helpful and pleasant. Check in and check out were easy. Vickery Resort: a great family spot! We appreciate the modern, well furnished and clean condos. They are as pictured on the website. This is a place that has easy access to the lake to swim, boat, or fish. I love being able to sit on the deck and look at the lake to relax. We have our annual family reunion at Vickery Resort. It is able to accommodate all our needs, handicapped as well. Before booking, I suggest calling to talk to Colleen, she will help you to find the condo that will meet your needs. We have vacationed in Branson for many years and this is the BEST place to stay year round. It has everything you could possibly think of and always move-in ready. Just wish we could stay longer!!! We chose this location after a long search of all available rental units through out the area and determined it would meet our needs for our family get together. There were a total of 12 adults and 5 children we rented 4 units and had a wonderful time. One family broth there boat and docked it. The available swimming in the pool and in Table Rock Lake were so relaxing and both right out back of the units. If we were do this again we would diffenitly say at Vickery Resort!!!! Vickery Resort was a clean, comfortable and relaxing place for all. Best vacation we've ever had! Colleen is truly the best and most accommodating person! Vickery Resort is amazing and I can't wait to go back! Thanks for the review. Can't wait to see you next time. Enjoy your summer. Glad you enjoyed your stay with us. Come back and see us soon.